Since being passed in 2008, six laws have been passed by the NC legislature that have either modified or delayed six of the 13 Jordan Clean-up rules. That was prior to 2013. The latest effort by the legislature seems to be heading toward an additional three-year delay to the Strategy’s implementation. While delaying is better than repealing the clean-up effort, there will continue to be negative effects on the lake from this action. On a recent trip to Chapel Hill, one lost opportunity for controlling pollution was evidenced in a recently opened Wal-Mart built on over 62 acres of former forest land located on 15-501 in north Chatham County. Since Jordan New Development rules were delayed in the 2012 Legislative Session, this commercial development was able to be constructed without having to control runoff of nitrogen and phosphorus. The nutrient export from the 62 acres of forest was around 60 lbs of N per year. Nitrogen runoff from the new Wal-Mart site site is likely 10 to 20 times more than that depending on the stormwater controls used at the site. With the delays in Jordan’s nutrient runoff controls on new development, this annual increase in pounds of N will end up in Jordan Lake. Now Open! 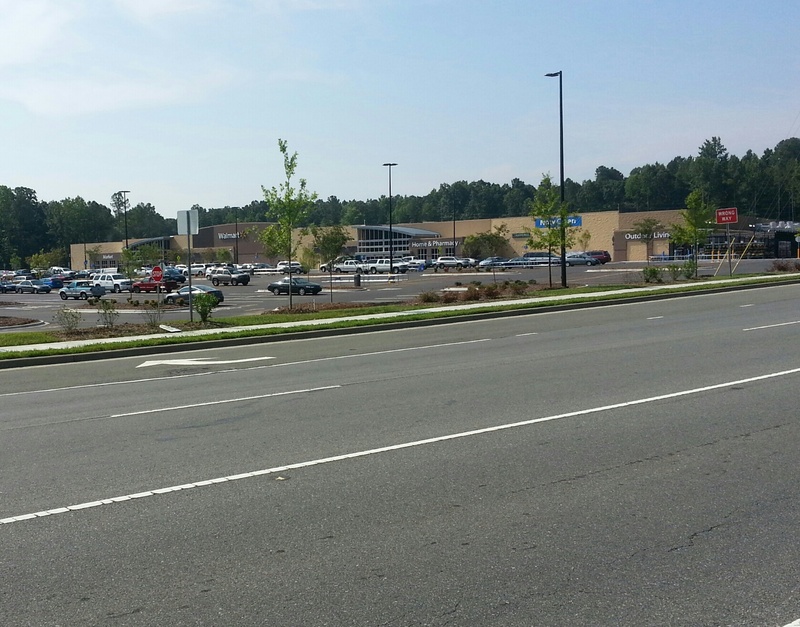 Chatham’s most recent WalMart was developed without nutrient controls on runoff. Since 2008, pollution from new development to Jordan has been kept in check largely by the burst housing bubble and the associated recession. In case you hadn’t kept up with recent headlines, the housing market is on the rebound and pressure for developing land is on the rise. Both housing and commercial development will increase over the next 2-3 years and result in more pollution from development to the lake. The plan to prevent that is being delayed yet again and will result in a more challenging clean-up effort over the long-term. After checking with the calculation tool, I updated the nutrient estimated increase from this commercial dev’t. ← Heavy rains & runoff, then what?